I can't believe that it's Labor Day weekend! Fall, cooler weather, shorter days and apple picking are on the way while warm, breezy days, capris and sandals are on the way out. On the bright side - starting to change over my wardrobe mean I get to indulge myself in a new pair of shoes. What? You don't buy a new pair of shoes each fall? I guess it's a habit left over from getting ready to go back to school. I can't decide which ones to buy. Spectator pumps. So cute and love that they are kinda retro, the black and white contrast and that they are Mary Janes (kinda). Cute bowed pumps. Adorable. I love the bow, the slightly chunkier heel and the scalloped edges. Which ones do you think I should buy? Ooh, I don't know. I really like them both. Can you buy both? I say if you can by both. I know they will look great. Hmmmmmm.....there's a concept! CAN you have both? Both adorable - love the Mary Jane style, no matter what. Just don't trip! Love the black and white mary janes!! The first one! My mom likes it a lot! 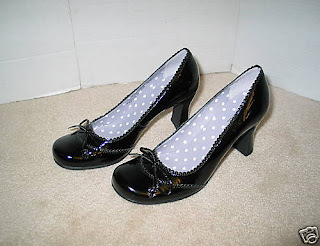 They are both very cute, but I absolutely love spectator pumps! My daughter loves Mary Jane's. Inventory your closet; the decision is all about justification! Do you already have spectator pumps? Several pair of Mary Jane's? If so do the Mary Jane's have heels or are they all flats? How many pair of solid black heels do you have? Are they open toed? formal? Which pair best fills a "desparate need"? I LOVE the first pair of shoes, omg, can I steal them from you?! OMG, the spectator pumps are HOT! Get THEM! I always get a little weepy when it comes to time to put away my sandals and bring out the boots.